KEY FEATURES: Tree to 12m. LEAVES alternate to 40cm, with 8-18 leaflets, paired to alternate, often with 1 terminal. LEAFLETS oval, to 10x4cm, strongly toothed, yellow midrib, sides unequal, onion-like odour when bruised. FLOWERS axillary clusters, fragrant, white, 12mmØ. FRUIT oval, 2cm long, ripen yellow. SIMILAR SPECIES: See under Chinaberry Tree (Melia azedarach). GENERAL NOTE: Many uses. Earliest reference to it is in Sanskrit writings that are over 4,000 years old. 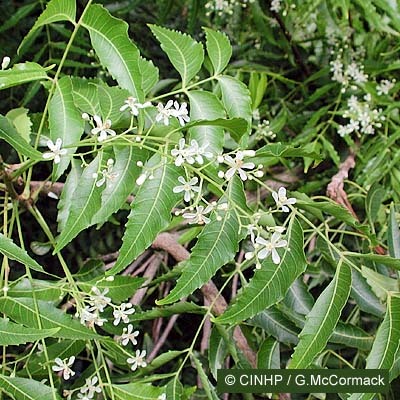 Parts of this tree have been used for medicine, shade, building materials, fuel, lubrication, and as an insecticide. Mature at 3-5 years, and fully reproductive at 10 years, and can live to 200 years. Typically the 20kg of fruit contains about 2kg of seed kernel, and this contains about 20grams of insecticide extract, mostly a complex of chemicals called Azadirachtin. It is extracted by leaching with water, or with nonpolar solvents. 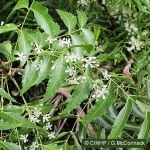 In rural India the Neem is called the "village pharmacy" because it "cures" diseases and disorders ranging from bad teeth and bedbugs to ulcers and malaria. The seeds, bark and leaves contain compounds (called limonoids) with antiseptic, antiviral, antipyretic (=reduce fevers), anti-inflammatory, anti-ulcer and antifungal uses. Neem extracts contain various insecticidal and insect-repelling chemicals: (a) it has been approved by the US EPA for use on food crops, and is non-toxic to birds, beneficial insects and mammals (including people); (b) it is effective against head lice and scabies; (c) one chemical is a more effective insect-repellant than DEET. One extract is toxic to resistant strains of malaria; another extract is toxic to several fungi including those causing athlete's foot, ringworm, and thrush (Candida); another extract can prevent tooth decay and periodontal disease; another extract is toxic to the herpes virus and cures cold sores; and extracts have had encouraging results in AIDS prevention and a possible cure. On the side extracts can increase the immune response thus reducing cancers and tumours;reduces allergic reactions; the oil can prevent pregnancy; extracts reduced fertility in male monkeys without inhibiting libido or sperm production, making it potentially the first male birth control pill; can reduce heart attacks and reduce high blood pressure.